To me, one of the most exciting parts of home rentership, aside from doing laundry whenever I want and not hearing the neighbor's conversations, is having a yard. This house has a small front yard and a decent sized backyard. I don't know the dimensions, but the backyard is big enough for at least 15 people to be mingling around comfortably. I wouldn't push it past 15 though. 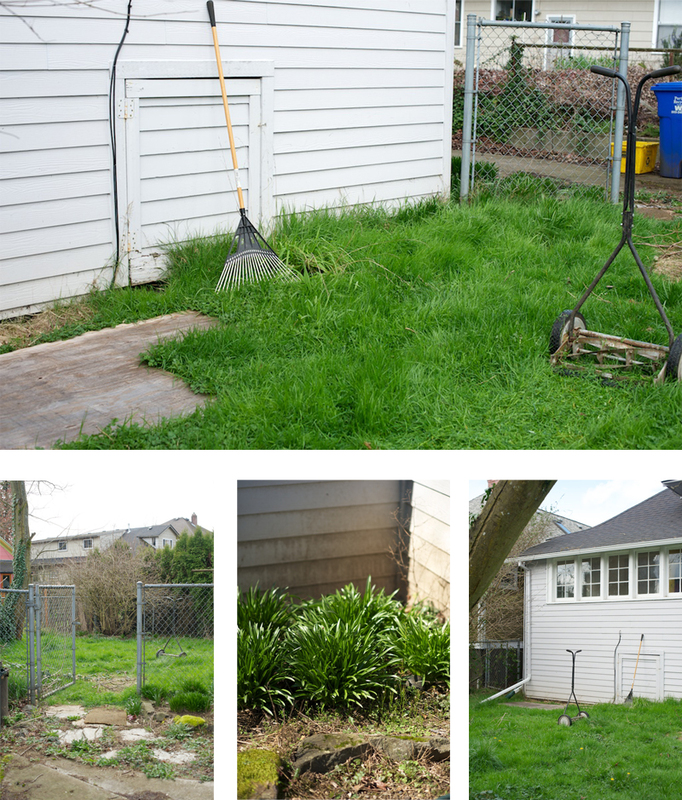 The landlords shared that the yard was ours to do with as we pleased (aside from cutting down the massive tree in the back, of course). We rent-inherited a yard that hadn't really been touched in at least several years. As I've gone through the stages of initial clearing to beginning to plan what to do with the space, I've had my fair share of funny moments, frustrations, and general questions. Every now and then I'll share a yard/garden update with you, because as a beginning gardener, I find the most helpful advice comes from a wide range of gardeners, from my seasoned "I can garden on bedrock" mother, to the next-door neighbors who have an impressive garden, to my good friend Emily who used to work on a farm and loves sustainable food as much as I do. My first several afternoons in the yard blend together. I spent hours weeding, cutting away nasty prickly vines with entrenched roots, and trying to make some sense out of the overgrown plants. After my first few swipes with the push mower, I discovered my real enemy: dandelions. More dandelions than I've ever seen. 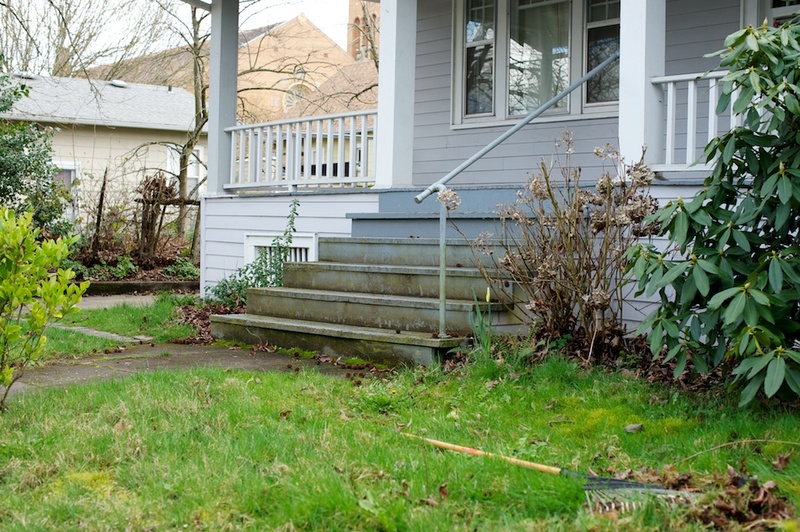 Portland's climate is perfect for this invasive plant--many yards are dotted with them and I can tell that the yards that seem dandelion free are fighting an uphill battle...a closer looks shows a mostly cleared yard with one or two dandelions poking out of the ground. The dandelions in our backyard and front yards were the size of large serving platters, with deep roots that were thicker than my big toe. I filled our entire compost bin--the size of a large commercial trashcan--with the fallen dandelions. Our backyard is also home to a large wooden board that was placed over a patch of dirt. I didn't have any insight as to what this might be, but upon closer inspection, I'm 99% sure that a previous tenant had a garden or raised bed in that location. The soil is rich and I detected suffocated sprouts struggling in the dirt. Along with weeds and sprouts, I also dug up an old pair of clippers buried in the ground. 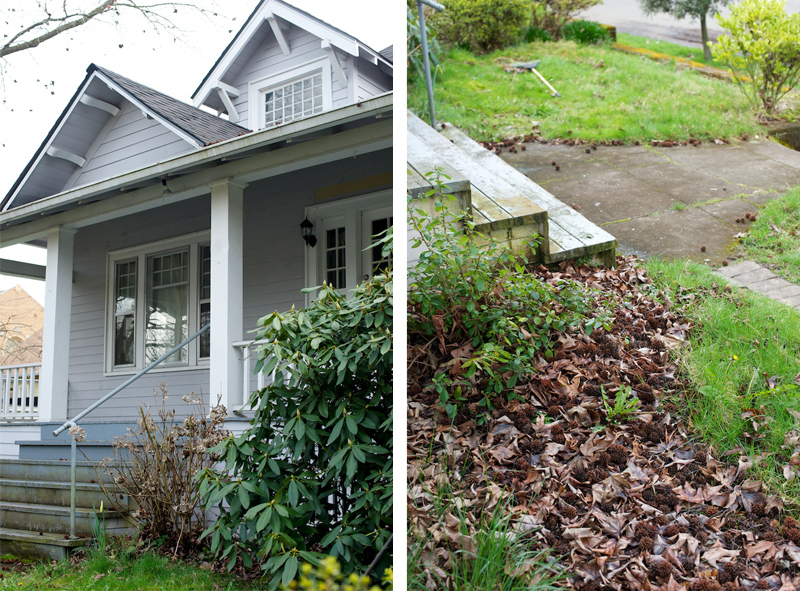 The first area I spruced up (I'm using this term lightly) was the front yard. The frontyard has several plants in it: a hydrangea, three mystery bushes, and a fern. I planted two ranunculus and three violas along the sunnier side of the house. The side with the hydrangea is almost completely shaded, so I haven't planted anything there yet. For the first few days I was pleased with how well the plants were doing--growing and generally looking healthy. On the third day, I encountered my first nemesis: SLUGS. Slippery, slimy, hermaphroditic slugs (they can cross-fertilize as they have both male and female parts). Along with about 6 slugs, I saw little trails of their slug eggs. I immediately killed everything I saw and researched natural methods to keep slugs away. Many sites recommended stale beer, so I opened up a bottle of Full Sail IPA and poured a little into two ramekins (and drank the rest). The next morning the IPA ramekins were full of dead gnats, but no slugs. I looked closer at the yellow dwarf ranunculus. It looked like it had been eaten even more over night--and I found another slug on it. I moved the ramekin a little further away...I think I'd put it too close, allowing the slugs to be attracted to the beer and then to the nearby flower. This was nearly 2 weeks ago. I've switched the beer in the ramekins several times and have been slug free since. 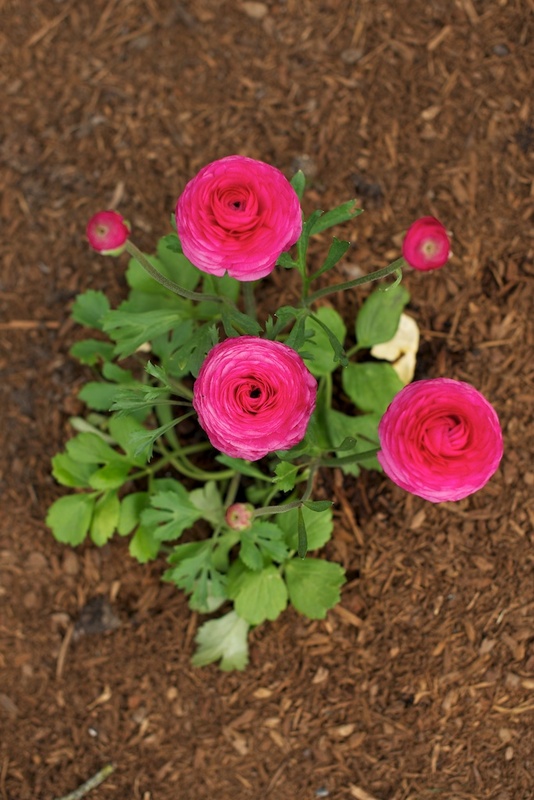 The pink ranunculus is prospering, sending up gorgeous circles of pink flowers: geometry in nature. 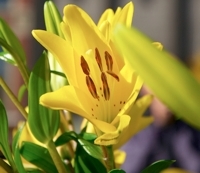 The ravaged yellow flower, while not dead, has not recovered. Yesterday I spotted some new leaf growth, but I've yet to see any sort of flower growth. This could be from our latest garden pest: the neighborhood cat. We noticed this neighborhood cat the day after we moved in. He/she was sitting on our porch, apparently using our doormat as a scratching pad. I'm a pushover when it comes to cats, so I think I said 'awww' and tried to get the cat to come closer to me. The cat ran away, predictive of all of my future interactions with this animal. The cat likes to visit our back stoop at night, activating our motion detector light and then running away. When we came home from lunch yesterday the cat was lounging in our driveway. As we approached it, it sprung up and lept the fence into our neighbor's yard. Several mornings ago, I saw the cat in the narrow space between our home and the neighbor's. It was systematically digging up holes and then walking away. That day I went outside to check on the front plants and found a cat hole around, you guessed it, the yellow ranunculus! I consulted books and the web for natural cat deterrent methods and overwhelmingly read that cats don't like citrus. So I ripped up the peel from my breakfast orange and sprinkled it around the flowers. I'm happy to see the yard finally getting spruced up, as it means I can turn my attention to my edible garden. I've planted herbs--oregano, parsley, sage, and chives--in container gardens on the east side of our house. I've cleared away part of the former garden space for a future raised bed garden and have planned what to plant in the beds. I've researched companion planting. And most excitingly, I found a make-your-own raised bed kit at Urban Farm Store, saving me a trip to Home Depot to buy a saw (we are renting, after all!). I'll report back soon about my edible garden and any unexpected pests and nuisances I encounter along the way.